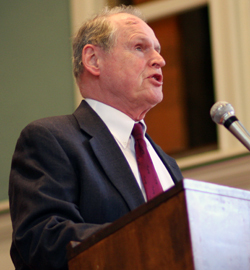 Dr. James Barnes, a Wabash College professor emeritus of history, delivered Thursday’s Chapel Talk. Barnes took the opportunity to talk about dog guides, how they’re trained, and how he works with his trained seeing-eye-dog. “What It Means to Guide Someone” was the title of Barnes talk. And all the time at the podium Barnes’ current guide dog “Rex” was at his feet. Barnes was quick to point out that “Rex” was not the dog’s real name but he didn’t want to use that and cause any confusion should someone speak to the dog when it’s doing its job helping the Rhodes Scholar and author across campus. Barnes talked about the history of guide dogs and how they’re trained. He is currently on his sixth service dog and noted his current best friend is now 11 years old. He detailed the challenges of getting a dog trained from puppy to service dog and that many schools now breed their own animals for quality control.